In case you’re wondering why the Left won’t discuss the “trade war,” I have your answer. President Trump is winning. Let’s look at the timing of this two-year decline. The Census Bureau on Tuesday reported America’s trade gap in December actually dropped slightly over the month to $44.3 billion. But on the whole, the country’s trade shortfall in 2016 ballooned by $1.9 billion – or 0.4 percent – over the year to $502.3 billion. That’s the largest the gap has been since 2012. Exports last year were down nearly $52 billion – 2.3 percent – though imports also declined by $49.9 billion, or roughly 1.8 percent. A strong dollar and a sluggish global economy were cited by economists as complicating factors affecting U.S. trade dynamics throughout 2016. Now, to unlock greater economic opportunity for American exporters, President Obama’s Middle Class Economics strategy has prioritized increasing U.S. exports through smart, cutting-edge trade agreements. These 21st century trade agreements, such as the Trans-Pacific Partnership, will open vital markets for our exporters, support jobs, level the playing field for our workers with groundbreaking labor standards, and enhance American competitiveness by shaping globalization in a way that builds on our strengths in the global economy. And if trade agreements with high standards are to deliver their maximum benefits to American families, then it is imperative that the United States government vigilantly monitors and enforces them. That is because when our trading partners in any region of the world break the rules set in our agreements and undermine American exporters’ hard-won access to international markets, it hurts our economy, it costs us good jobs, and it undercuts efforts to invest in and grow the jobs, skills, and technologies that will thrive in the 21st century economy. To that end, with bipartisan support, the Obama Administration has executed the most robust upgrade of United States trade enforcement in the history of modern trade policy. The result has been an unprecedented record of enforcement victories against countries ranging from China to India to Indonesia to Argentina. Those enforcement victories have been worth billions of dollars to American workers, businesses and farmers – and every billion dollars of American goods and services exports supports nearly 5,800 jobs. I suggest Politifact fact-check this drivel. Because one only need look at how China feasted during the Obama era. You can bet China saw Obama coming. While Obama’s 2009-2011 numbers showed promise, don’t be fooled by the hype. The U.S. economy was in triage because of him. By 2012, Obama had printed over $4 trillion “quantitative easing” dollars. And by now, China recognize him for the fiscal fool he was. Thus, in 2012, the shift upward began. 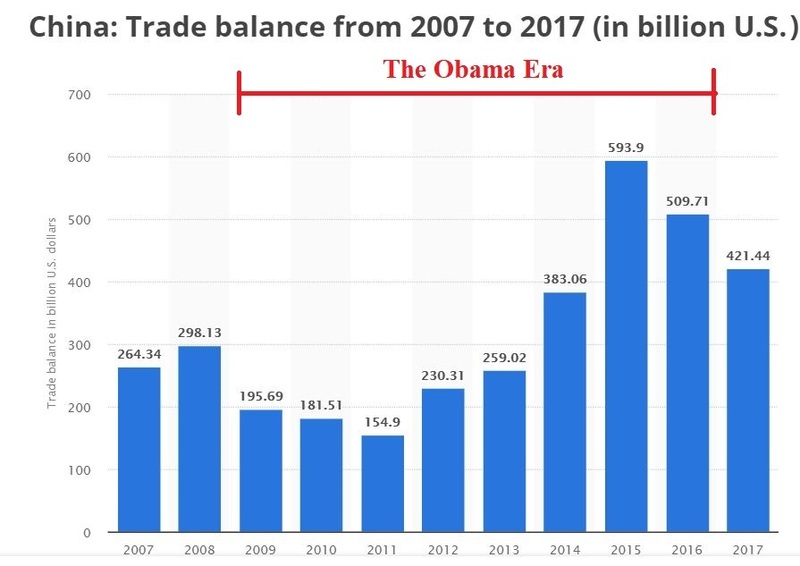 Obama went from a trade deficit of $154.9 billion to over half a trillion in 2015 and 2016. These were the largest deficits in American history. Recall that Obama called this “the new norm”, as he reminded us to get used to 2 percent GDP growth. In President Trump’s first full year, the trade deficit with China fell over $80 billion to around $420 billion. And the trend is that these numbers will continue to fall, and not just with China. Do a search here, and look at the “doom and gloom” predictions for a trade war that a 3-year old would realize President Trump couldn’t lose. 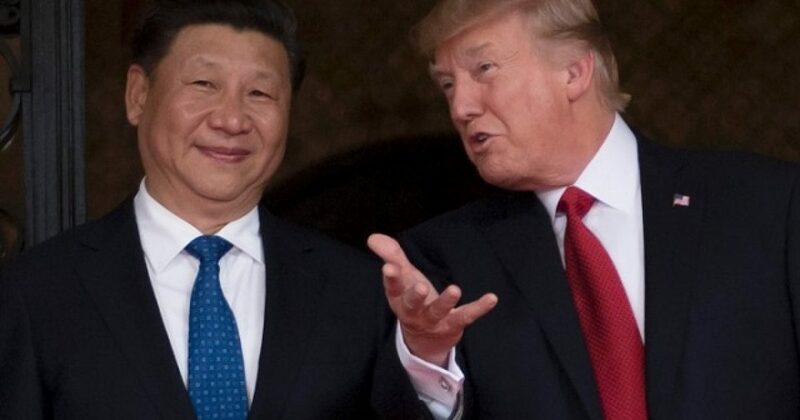 It was pathetic to see the string of Leftist clowns trying to convince Americans that we could lose in a war where we have a $350 billion deficit, and represent the largest customer to China. Only a fool would believe such nonsense. But Leftists are fools convincing other fools. Aside from the obvious, there is the notion that most Leftists openly hoped for Armageddon. They wanted Trump to fail, as he implemented sound fiscal policies. In the end, Trump averted Armageddon. Now the trade deficit heads south, and not just with China. I’m not sure where it will end up. But you can bet the number will be substantially lower than the almost $800 billion total trade deficit under Obama.